Yesterday was Hagbard’s 30th birthday and he had requested gyros for dinner. I made homemade Tzatziki sauce, gyro meat and pita bread. I pretty much spent all day in the kitchen yesterday so today is leftovers or pbj! I made the Tzatziki on Saturday night. Peel cucumber. Cut in half and scoop out the seeds. Cube the cucumber and place in a colander over a bowl. Sprinkle cucumbers with salt and let stand for at least 30 minutes. Drain water and pat cucumber dry. In a food processor combine the remaining ingredients and process until well-blended. Refrigerate. Make at least 2 hours ahead so flavors blend. Sunday morning I made the gyro meat. In the past we’ve bought frozen gyro kits at the grocery store and gyro meat over the internet. These were somewhat expensive options. We wouldn’t like the sauce or pita bread in the kit so it was pretty wasteful. After trial and error over the years I’ve arrived at a recipe for “gyro loaf” which pleases my family. I’ve found using fattier ground beef is important and using the food processor gives it the texture my family likes. I often freeze half of the loaf after cooking it and that works well. Preheat oven to 325F. Mix everything in a food processor for 1 minute. Shape mixture into a loaf- about 5 1/2 ” x 11″ and 1 ” tall. Cover with foil and bake 45 minutes to 1 hour. Let cool several hours or overnight before slicing. Warm slices briefly in a skillet or microwave before serving. I had decided to make pita bread instead of buying it this time. I found a new recipe for Arabian Pita Bread on Food.com that looked simple and had good reviews. The recipe calls for 1T dried nonfat milk powder. I rarely use powdered milk but had some in the cabinet so I pulled it out. My box apparently expired in December last year so I decided not to use it. Maybe it would’ve been okay but maybe not. I thought I’d just use some regular milk but totally forgot to add it. I used honey instead of sugar. Other than that I followed the recipe. I mistakenly stacked some rolled out dough between pieces of waxed paper. They stuck fast. None of my pita bread really formed a pocket but that wasn’t important to me since we put everything on top and fold it to eat. It seemed that the ones that were a bit thicker worked a bit better since the thinner ones got crispier and stiffer. I think if I did it over I’d make the dough balls bigger and not roll them as thin- and not stack anything! In the end I got some bread and it worked for our gyros. I thought we had olives to add to our gyros but none could be found. I also totally forgot to make french fries until we were putting food on our plates so we just had gyros last night. Oops. Everyone enjoyed the gyros though. Little Lulu had meat and feta cheese on her pita bread. 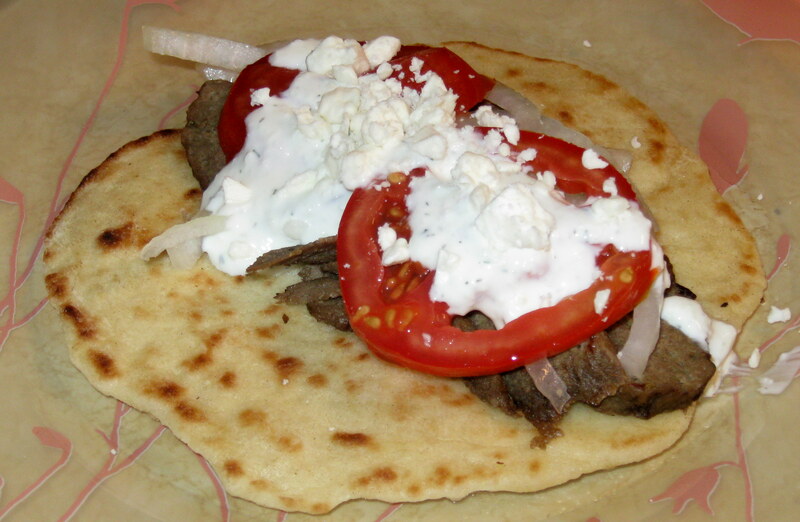 Hagbard and I had meat, tzatziki, onion, feta cheese and tomato on our bread. Later in the evening we had an ice cream cake Hagbard had picked up from Dairy Queen. I love making and decorating cakes but it is his tradition to have an ice cream cake on his birthday so he usually just buys one.